I spent this past weekend in upstate New York with all of my beautiful girlies from Hamilton. One of our own, Little MRS Trailmix tied the knot! The ceremony was brilliant– I had never been to a traditional Jewish wedding before, and I pretty much love anything that involves a new-to-me cultural or religious tradition. The reception was fantastic! The food was delish, and the band was SO much fun! We basically danced and sang our faces off all night long! On Saturday morning, we woke up early to accompany the bride on a pre-wedding, get-your-jitters-out run through picturesque New Lebanon, NY. We ran three miles down Lovers Lane…seriously…past farms and open fields. It was a wonderful start to the morning! The bride made all of the table labels– they were just so cute I had to take a picture…I know how hard she worked on them! The place settings were also made by the bride and groom! 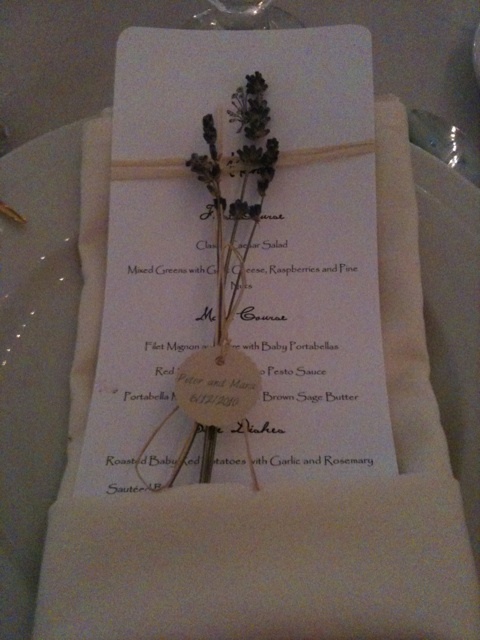 My favorite part was the sprigs of lavender with their names and wedding date attached. 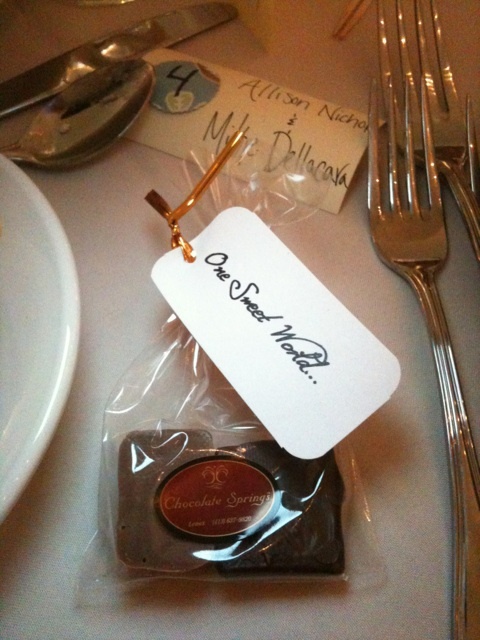 The wedding favors were gourmet chocolates with a tribute to the Dave Matthews Band–the Bride and Groom’s favorite band. My drink of choice: the always-classy Bacardi and diet. 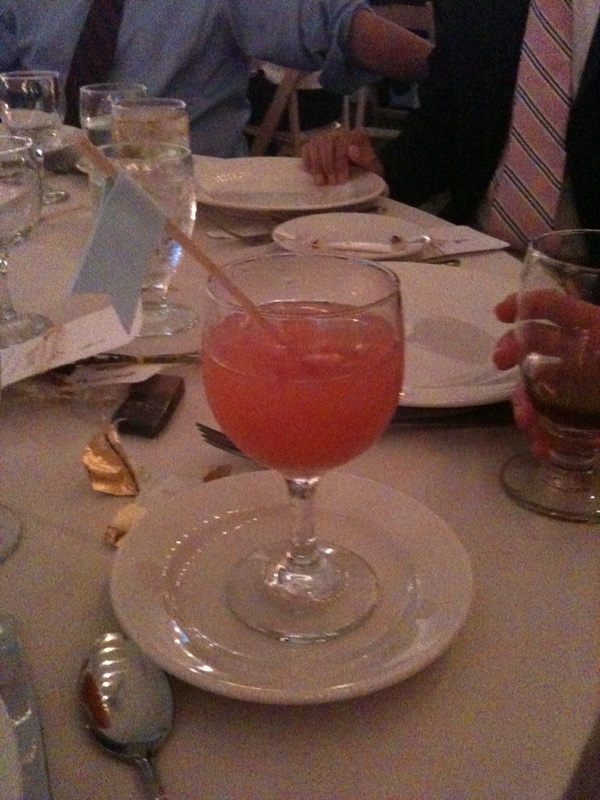 It’s my guilty pleasure…actually not so guilty…Check out the drink flag! Another DIY methinks. Someone else’s guilty pleasure…I think I just liked the color. The wedding was so much fun! After reading Mrs. T’s wedding blog, it was so cool to see everything come together. I think everyone had an amazing time– it was one for the books. A wedding to aspire to. As for “cheat meals,” I think that depending on your diet/ lifestyle, they are an approved necessity. Some people need them in order to stay sane and on track with their healthy eating, while others can happily forgo the cheat. I fit somewhere in between those two groups: I eat clean, healthy meals probably 85-90% of the week. When I feel like eating something that’s not in my “diet,” I don’t beat myself up, because I know that I’ll be back on track the next day. 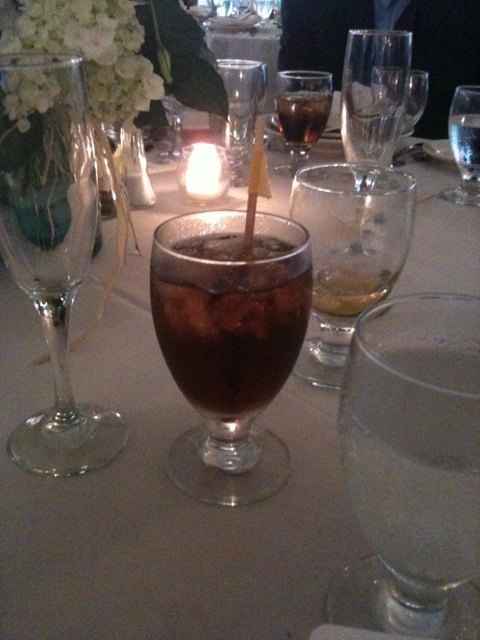 So if I’m at an amazing wedding and I wish to partake in some adult beverages and chocolate, I do! When am I going to be at this wedding with this chocolate ever again? It took me a while to get to a place where I didn’t punish myself for “cheating” and now that I’m there, I’m much happier. Life is so much more fun when you can enjoy yourself with friends without thinking about sticking to your normal diet 100%. The trick is to hop back on the wagon after your meal/day of indulging. It can take practice, but it can help when you know that one day of eating is not going to have a huge negative impact on your goals. What is your “cheat meal” philosophy? Allison is a Certified Holistic Health and Nutrition Counselor. She specializes in empowering individuals through 1 to 1 Health Counseling Programs to cultivate a carefree relationship with food, and to have more vibrant, natural energy by transitioning to a whole food, often Paleo, diet. DISCLOSURE: In order for me to support my blogging activities, I occasionally may receive monetary compensation or other types of remuneration for my endorsement, recommendation, testimonial and/or link to any products or services from this blog. However, I only recommend products or services I believe in and trust. Heal Your Gut Like a Pro! Sign up for the Frisky Lemon Newsletter to get Allison's 6-Step Gut Healing Protocol for Free! *NEW* Virtual Health Coaching Membership! Heal Your Gut Starter Kit! DISCLOSURE: In order for me to support my blogging activities, I occasionally may receive monetary compensation or other types of remuneration for my endorsement, recommendation, testimonial and/or link to any products or services from this blog. However, I only recommend products or services I believe in and trust. © 2019 Allison Nichols | Holistic Nutrition Counselor. All Rights Reserved. Get my 6-Step Gut-Healing Protocol and start healing your gut like a pro! Sign up for my newsletter and get access to this exclusive offer to help you get on your own, personalized path to healing.